Written and Media by Kelsey Neier. There are several categories under which you can enter your work. The Scrib accepts fiction writing, non-fiction writing, poetry, video, and visual art. You simply go to The Scriblerus’s website and click on the “submit” button at the top of the page. After you click submit, you can read the rest of the “Mission Statement” and “Submission Guidelines” and then fill out the form underneath that to complete your entry. Currently, Professor Davis is in charge of running The Scrib followed by editor-in-chief Sarah Stone and editors Abi Hillrich and Kelsey Neier. 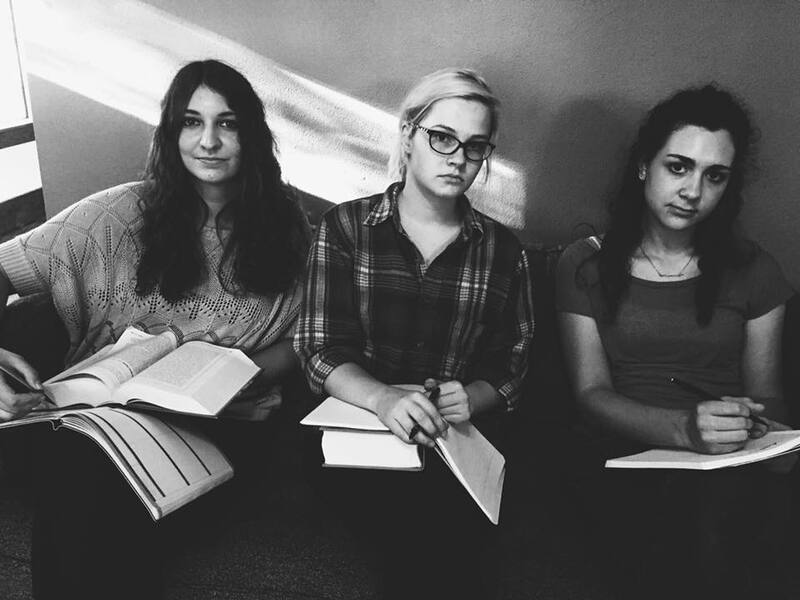 You can be a part of The Scrib Staff every semester by signing up for Literary Production (ENGL 238 01). The meetings are typically held Wednesday evenings at 4:30 p.m. in La Casa de Cultural. 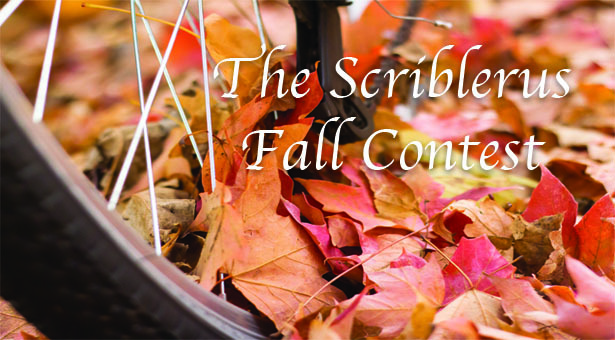 The Scrib is very excited to announce its Fall Contest for 2015! 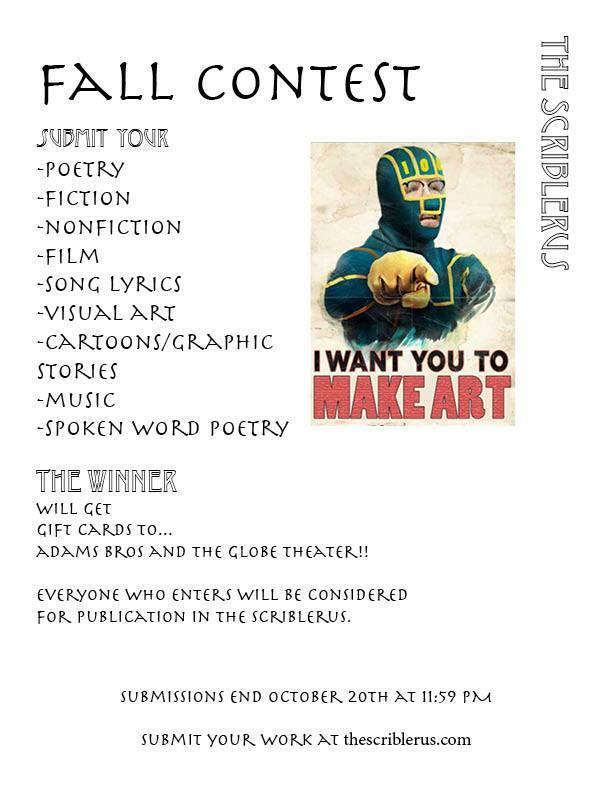 We will be accepting submissions until 11:59 p.m. on October 20th! The winner will receive gifts cards to the delicious Adam Bros and awesome Globe Theatre! What are you waiting for? Submit your work today! We look forward to seeing it! I can honestly say that I’ve had a great time being a part of The Scrib staff this year. I have learned about what kind of writing style works best for our online newspaper and how to properly review submissions. I’ve learned how to identify an article or picture that sets it apart from other submissions. I love looking for something that’s visually intriguing, creative and captures my attention and emotions. I’ve also met some great people and made some new friends along the way. I look forward to being a part of The Scriblerus for many more semesters to come. I love Photography, Fashion & Technology!